We present a remeshed hybrid particle-mesh method for the simulation of three-dimensional compressible turbulent flow. As a result of the strain of the flow, the mesh free smoothed particle hydrodynamic (SPH) method suffers from particle’s distortion which induces an inaccurate representation of the diffusion effect along with the pressure gradient (rate-of-change of momentum). To overcome this problem we introduce a grid which is used to remesh (reorganise uniformly) the particles to ensure a regular particle distribution and convergence of the method. To take advantage of both the Lagrangian and the Eulerian schemes, the right hand side of the turbulence model is computed on the mesh, and the change of momentum is later interpolated to the particles where the advection takes place. The method is capable of providing quality simulations while maintaining its robustness and versatility. We couple the hybrid remeshed particle-mesh method with Brinkman penalisation to be able to simulate viscous flow with high Reynolds number where complex geometries are required. A penalty term is added to the Navier-Stokes equations to impose the boundary conditions. The boundary conditions are enforced to a specific precision with no need to change the numerical method or the grid. The remeshed particle-mesh method with Brinkman penalisation provides a good quality simulation and the results showed good agreement with analytical solutions. Lid-driven cavity velocity magnitude fields with vectors fields, the upper moving wall is not a solid no slip boundary, rather a penalised area of the computational geometry. The main idea of the Brinkman penalisation method is to model the solid obstacle as a porous medium. The governing equations for compressible fluids and penalised Navier-Stokes for the porous medium are solved simultaneously, therefore there is no need to have an interface conditions in between. 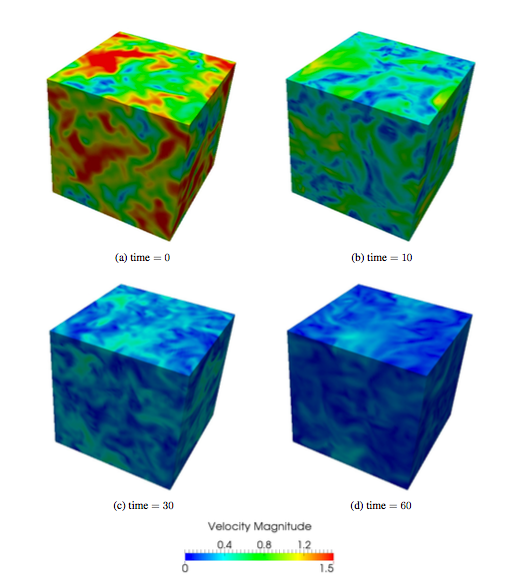 Our aim is to develop a hybrid Eulerian Lagrangian based numerical method for the solution of viscous compressible/weakly compressible flow characterised with high Reynolds number around complex geometry. A robust meshless solver has been developed for the numerical simulation of fluid flow problems. 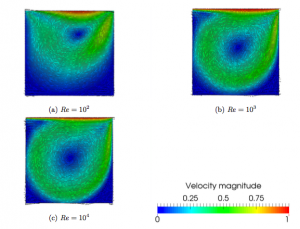 Vorticity magnitude of the thin double shear layer simulation with Re = 104. The hrSPH is able to avoid the development of the spurious structure. Platelet (dark grey) aggregation in the plasma flow (light grey), generating the thrombus at the injured vessel (red curve).